Summer is coming and we have the perfect Boho Ibiza Style Bags for you! Handmade with reusable materials from second hand items found on flea markets in Spain. Boho shoulder bag white panther is a high quality Handmade Ibiza Style Hippie Bag for the Winter Season! Made with re-usable materials from second hand items found on flea markets in Spain. Boho Shoulder bag Culebra is a high quality Handmade Ibiza Style Hippie Bag for the Winter Season! Made with re-usable materials from second hand items found on flea markets in Spain. FREE SHIPPING to Spain and the rest of Europe. Unique Handcrafted Bohemian bracelet by Anntas. Unique Handcrafted Bohemian bracelet by Anntas with a Tibetan Copper Medallon. Beach Bag Antique is a Handmade Ibiza Style Hippie Bag. Made with re-usable materials from second hand items found on flea markets in Spain. Beach Bag Pierrot is a Handmade Ibiza Style Hippie Bag. Made with re-usable materials from second hand items found on flea markets in Spain. Beach Bag Verdi is a Handmade Ibiza Style Hippie Bag. Made with re-usable materials from second hand items found on flea markets in Spain. Beach Bag Winter Indiana is a Handmade Ibiza Style Hippie Bag. Made with re-usable materials from second hand items found on flea markets in Spain. Boho Shoulder Bag Viper Winter is a high quality Handmade Ibiza Style Hippie Bag for the Winter Season! Made with re-usable materials from second hand items found on flea markets in Spain. There is only one of each Beach Bag listed available, so be quick to order! Back order is not available. Beach Bag Blanca is a Handmade Ibiza Style Hippie Bag. Made with re-usable materials from second hand items found on flea markets in Spain. There is only one of each Hippy Bag listed available, so be quick to order! Back order is not available. Hippie Bag el Oso is a Handmade Ibiza Style Hippie Bag. Made with re-usable materials from second hand items found on flea markets in Spain. Do these two go together or what??!! Beautiful fit, thank you Anntas! The Hippy Bag looks amazing, I am super happy with it!!!! Thanks! My name is Anna. I began Anntas – Bags and Bracelets four years ago as a personal project. 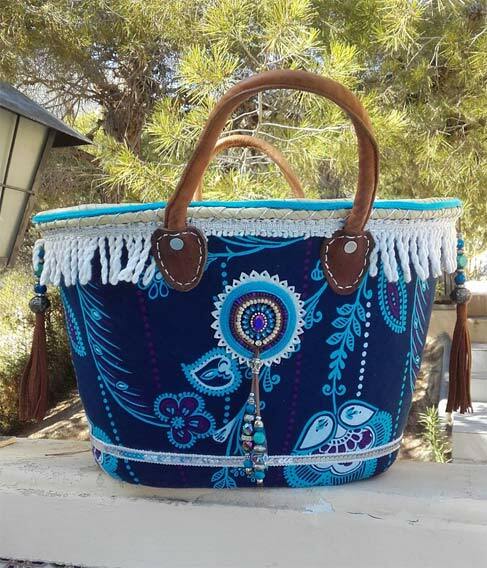 With the idea to create Ibiza boho chic style accessories, hippie bags and bracelets and other accessories using mainly reusable materials from second hand items found on flea markets. throwing away many, perfectly good, reusable materials for the sake of simply always buying “new”. So? I began. Thank you for visiting the website, and should you have any questions regarding any of the products, please contact us and we will be glad to answer you as soon as we can! Peace & Love, Anntas. From searching and finding scrap textiles and fabrics originating from Marrakesh, to finding stones, beads and leathers from all around the local area, to putting it together at home. After three years of promoting my creations solely via a Facebook page, and thanks to a lot of word of mouth among happy customers travelling between Spain and The Netherlands, there came a demand for an official website. Now, here people can purchase these hippie bags and bracelets that were born from the idea in which I have invested so much love and enthusiasm, and really is something that could not have been as successful, if it hadn’t been for the incredible help and support from my beautiful family!